09 Mar 2016 / 15:52 H.
AMONG the countless Shakespearean theatre troupes out there, The Handlebards from the United Kingdom is certainly unique. This all-male troupe, set up three years ago, consists of four actors who cycle their way around different venues ­performing works by William Shakespeare (1564-1616), arguably one of the world’s greatest storytellers. The four – Callum Brodie, 26, Matt Seager, 24, Calum Hughes-McIntosh, 25, and Tom Dixon, 25 – cover everything, from The Bard’s greatest tragedies to his ­famous comedies. To date, the actors have clocked more than 5,000 miles (8,000km) on the road and performed in over 200 venues worldwide. They have also played at ­several prestigious ­theatre ­festivals, including the ­Edinburgh Fringe Festival, the Tour de France Grand Depart Festival and Spin London ­Festival of Cycling. 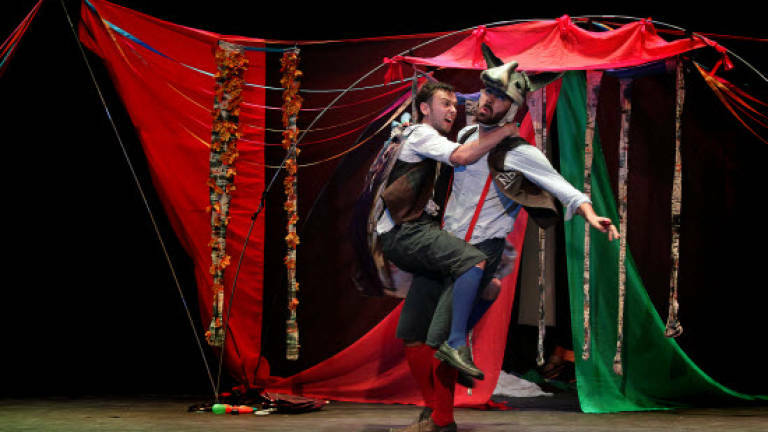 Now, The Handlebards is wrapping up its Southeast Asian tour in Malaysia after having performed in countries like India, Myanmar and Singapore. 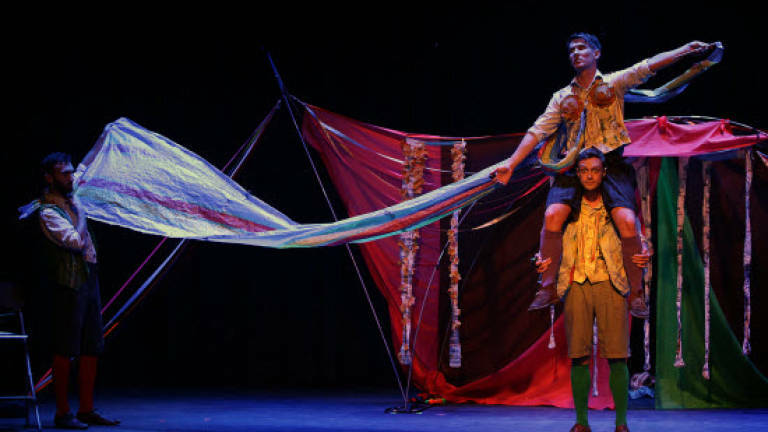 The troupe is currently ­performing one of ­Shakespeare’s most popular comedies, A ­Midsummer Night’s Dream, at PJ Live Arts, until March 13, with two shows at the Penang Performing Arts Centre this Thursday and Friday. A Midsummer Night’s Dream focuses on four young lovers who find themselves unknowingly caught in the mischievous antics of a group of fairies in an enchanted forest. During a recent preview of the show, we noticed how ­simple the set was. This was ­understandable, as the four actors could not easily ride their bikes ­lugging heavy equipment around this unfamiliar territory. 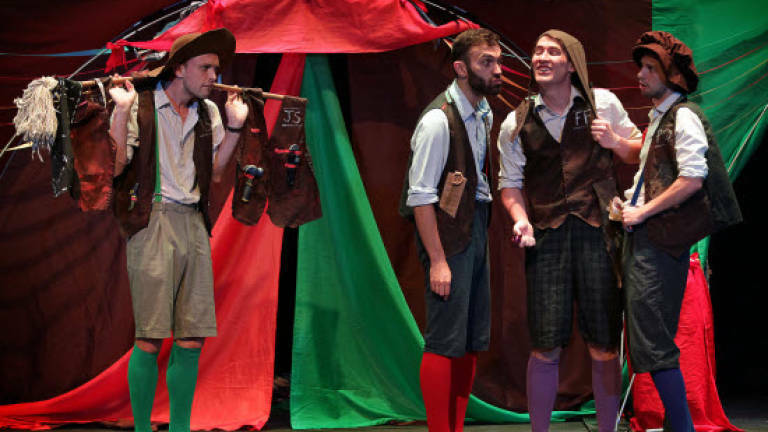 Despite the spartan setting, The Handlebards managed to put up an energetic and ­entertaining play that had the audience in stitches. There was great ­chemistry among the four actors, as they seemed to feed off each others’ energy during the performance. They each took on multiple roles, switching between characters with ease. 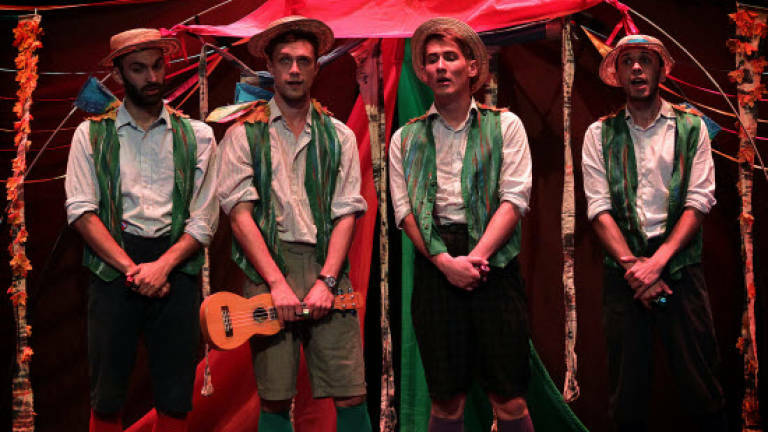 Dixon and the show’s ­producer Paul Moss are the original founding members of The Handlebards. These two friends from their college days were into the ­performing arts then and after graduating, they ­decided to combine their energy and put their love for the performing arts to good use. On their self-named website, they introduce themselves as “4 men, 4 bikes and some pretty epic Shakespearean adventures” who are out to “set the world on wheels with our unique brand of extremely energetic, charmingly chaotic, environmentally friendly cycle-powered theatre”. “For the time being, our focus is just staging Shakespeare ­productions,” says Moss, adding that perhaps, in the future, they will look into staging Greek mythologies and tragedies, as well as some plays from the esteemed Oscar Wilde. When asked which is their favourite Shakespearean play, both picked The Bard’s famous tragedy, Macbeth. Moss and Dixon had ­previously played Macbeth and Lady Macbeth respectively, having a fun time performing these complex roles onstage. They cheekily added that the play has enough blood, gore and romance to keep any ­audience glued to his/her seat. Asked to dissect the ­reason why Shakespeare’s works still remain relevant today 400 years after his death, Dixon says: “He knows how to ­construct a story. One of their best moments was when they learned that Sir Ian McKellen, the ­English actor famed for his roles in the Lord of the Rings and X-Men franchises, is a big fan of their theatre production.